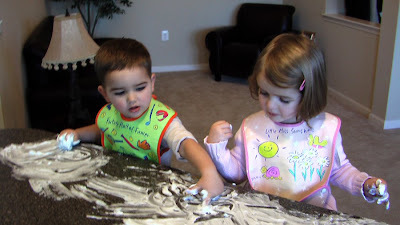 For everyone in Words and Images -- this is playing with shaving cream! :) My kids volunteered for the photoshoot. By the way, what do you all think of the whole sideways smiley face thing? :) Is this becoming acceptable writing protocol? I get the feeling like it's becoming a part of speech. Your children are so cute! They look like they are having a blast with it! I think that the whole :) thing is getting more acceptable because it shows the emotion of that sentence. I think many people can misjudge a sentence or a comment. Adding a smile face enhances their emotion for that sentence and how the reader will react to it. Good use of :) there, don't you think? Your kids are adorable. 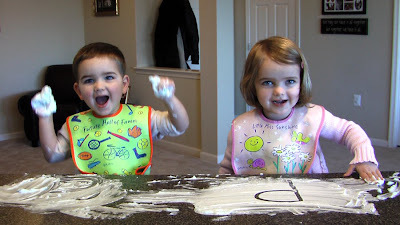 The photo brought back memories of when I played with foam as a child. I think it was called Silly Foam. Your kids are so adorable Sam! Your little boy looks just like you!